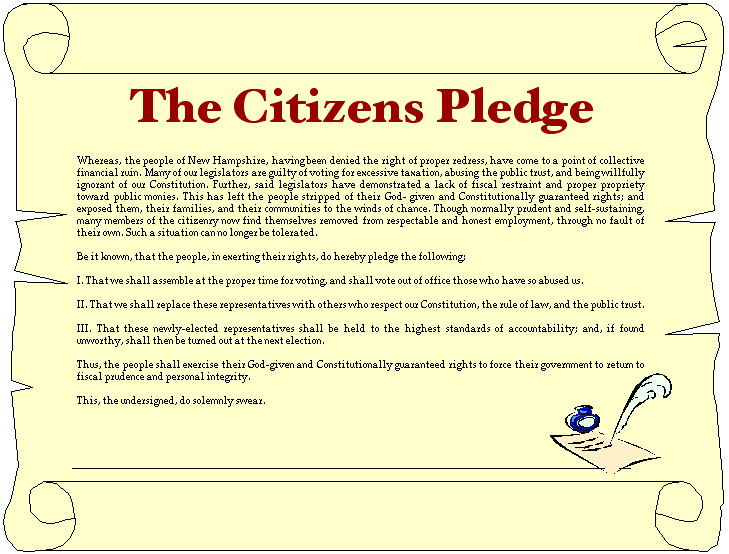 Whereas, the people of New Hampshire, having been denied the right of proper redress, have come to a point of collective financial ruin. Many of our legislators are guilty of voting for excessive taxation, abusing the public trust, and being willfully ignorant of our Constitution. Further, said legislators have demonstrated a lack of fiscal restraint and proper propriety toward public monies. This has left the people stripped of their God- given and Constitutionally guaranteed rights; and exposed them, their families, and their communities to the winds of chance. Though normally prudent and self-sustaining, many members of the citizenry now find themselves removed from respectable and honest employment, through no fault of their own. Such a situation can no longer be tolerated. 1. That we shall assemble at the proper time for voting, and shall vote out of office those who have so abused us. 2. That we shall replace these representatives with others who respect our Constitution, the rule of law, and the public trust. 3. That these newly-elected representatives shall be held to the highest standards of accountability; and, if found unworthy, shall then be turned out at the next election. 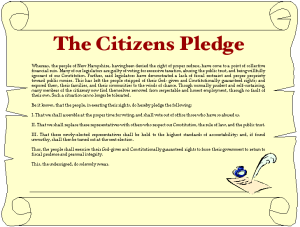 Thus, the people shall exercise their God-given and Constitutionally guaranteed rights to force their government to return to fiscal prudence and personal integrity. This, the undersigned, do solemnly swear.